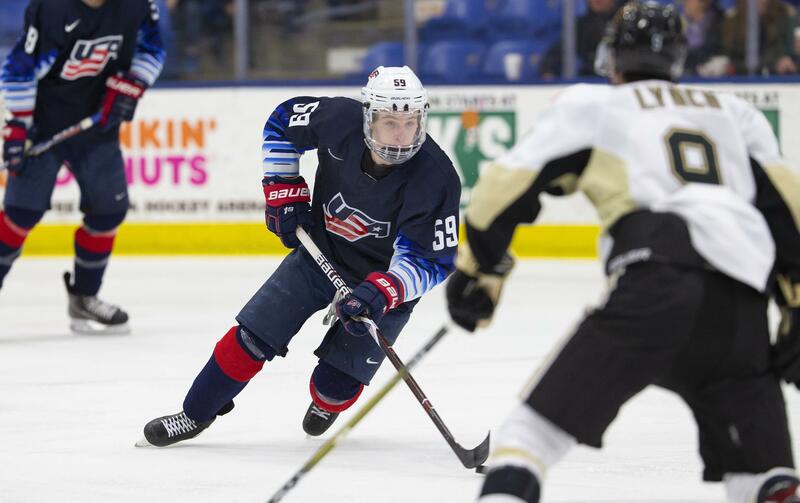 PLYMOUTH, Mich. - Ty Smilanic (Elizabeth, Colo.) scored twice in the U.S. National Under-17 Team’s 3-2 loss against the Muskegon Lumberjacks on Thursday, Apr. 11 at USA Hockey Arena. The U.S. National Under-17 Team’s record is 18-26-3-5, while Team USA’s combined record in USHL play is 30-22-2-6. The Lumberjack’s record is 41-16-3-1 (W-L-OTL-SOL). Muskegon took a 1-0 lead at 6:12 of the first period, the goal scored by Egor Afanasyev and assisted by Jack Williams. The Lumberjacks doubled its lead to 2-0 with 6:34 remaining in the frame. Oliver MacDonald was credited with the goal, while Williams tallied his second assist of the night. The U17s outshot Muskegon 9-7 through the first twenty minutes, but could not find the back of the net. 3:48 into the middle frame and on the power play, Smilanic cut Muskegon’s lead in half with a goal from the right circle, sending the puck past Ryan McInchak’s blocker side. Smilanic scored his second goal of the game with 9:25 remaining in the period to tie the game, 2-2. Zakary Karpa (Novi, Mich.) sent a backhand pass to Smilanic at center ice, who went on to send the puck into the back of the net at the top of the right circle. The U17s continued to outshoot the Lumberjacks through halfway into the third period, 29-13, but the game remained tied at two apiece. Despite strong chances for the U17s, Muskegon captured a 3-2 lead with 7:09 remaining in the third period. The go-ahead goal was scored by Afanasyev and assisted by Nic Belpedio and Tanner Kelly. Ultimately, the Lumberjacks emerged with a 3-2 victory. Noah Grannan (Germantown, Wis.) made 13 saves in net. NOTES: Team USA outshot Muskegon 34-16 … Team USA went 1-for-5 on the power play and 2-for-2 on the penalty kill… Brock Faber earned Hardest Worker of the Game… Oliver MacDonald earned Third Star of the Game… Ty Smilanic earned Second Star of the Game… Egor Afanasyev earned First Star of the game. The U.S. National Under-17 Team plays its final regular season game at USA Hockey Arena tomorrow, Apr. 12, against the Youngstown Phantoms at 7:00 p.m. ET. Tickets for the game can be purchased online at USAHockeyNTDP.com/Tix, by calling 734-453-6400, or visiting the box office.